December 8….Gingerbread House Decorating – Everyone is invited to decorate your own gingerbread house for the holidays. Cost is $50 per gingerbread house. Includes photo with Santa and Holiday treats. Call 806-762-8606 to reserve your gingerbread house. Decorations will be provided. LHUCA, 511 Avenue K; 4:30 – 6:30 p.m.
Tickets also may be purchased after 5:30 p.m. the night of the event for $15.00 @ the Ransom Canyon Fire Station at 1 Ridge Road. Maps are available. For more info, visit ransomcanyonchapel.com. Ransom Canyon (7 miles east of the east loop on east 50th St); 6:30 to 9 p.m.
December 8 - 11….Ballet Lubbock: The Nutcracker - It just isn’t the holidays without Ballet Lubbock’s annual production of Tchaikovsky’s The Nutcracker. This timeless and magical story of Clara, who dreams that her new toy nutcracker solider has come to life, will delight audiences of all ages. From an epic battle with the Rat King to the magical land of sweets presided over by the Sugar Plum Fairy, this is one performance you won’t want to miss! This year’s performances will feature Ballet Lubbock favorites Loi Wilson and Amar Ramasar as well as the rest of the Ballet Lubbock Company. Come find your inner sugar plum fairy and join Ballet Lubbock for Tchaikovsky’s "The Nutcracker"...a Lubbock holiday tradition. Lubbock Memorial Civic Center, 1501 Mac Davis Lane; Thursday, Friday and Saturday: 7 p.m. with a 2 p.m. matinee on Saturday and Sunday. December 9….Messiah Sing-along - "This concert will feature a Messiah singalong, presenting Part I of this beloved oratorio, plus “Hallelujah Chorus,” with the audience invited to sing the choruses! Musical scores for the choruses will be provided in the concert program. The Chorale will perform carols prior to the singalong portion of the evening. At-door tickets will be available 45 minutes prior to the event start. An upcharge of $5 will be applied to each ticket purchased at-door." Tickets can be purchased online at http://www.ticketsage.com/_lubbock/ or by calling Select-A-Seat at (806) 770-2000. Hemmle Recital Hall, Texas Tech University; 7:30 p.m.
December 9 (Repeats Dec. 16, 17, 23)….Cactus Family Christmas Celebration - Continuing in the longstanding Cactus Theater tradition, we are proud to once again present the "Cactus Family Christmas Celebration" concerts in 2016. Join your favorite Cactus performers for a nostalgic night of music and heartfelt Christmas joy as new memories are made in this most wonderful time of the year. We're setting the stage for a spectacular Christmas celebration presenting traditional holiday classics as well as several contemporary favorites. This is the FIRST of only four performances this year...and these special concerts always sell out, so get your tickets early so you don't miss the magic and fun that awaits! Reserved floor and standard balcony tickets are $25. Note: If you are also wanting to purchase tickets for kids 9 and under, we are offering specially priced $15 tickets for this age group if purchased through the box office by phone (806-762-3233) or in person (1812 Buddy Holly Ave) between the hours of 3:00 - 5:30 pm daily. Don't miss this timeless Lubbock tradition! Cactus Theater, 1812 Buddy Holly Ave; Doors at 7 p.m.; show 7:30 pm. December 9 - 10…Book Signing at Candlelight at the Ranch - Texas State Photographer Wyman Meinzer and Wilder Good author Nathan Dahlstrom will be at Cogdell's General Store to sell and sign copies of their new books: Horses to Ride and Cattle to Cut by Meinzer (text by Henry Chappell) and The Green Colt by Dahlstrom. The National Ranching Heritage Center in Lubbock is located on the Texas Tech University campus at 3121 Fourth St; 6:30 to 9 p.m.
December 9 – 10….38th Annual Candlelight at the Ranch - Visitors to the National Ranching Heritage Center (NRHC) at Texas Tech University will step back in time to experience a frontier Christmas during the 38th Annual Candlelight at the Ranch. The event will celebrate Christmas as it might have been on the open prairie from 1780 to 1950 and include more than 4,000 luminaries lining the paths of the historic park. More than 150 volunteer Ranch Hosts will dress in period clothing to recreate holiday scenes from another era. “Christmas was an important part of family life on the Plains, whether it meant stringing popcorn to decorate a tree, preparing holiday food, playing Christmas music or whittling a wooden toy,” explained NRHC Helen DeVitt Jones Director of Education Julie Hodges. “Visitors will see our volunteers doing whatever a family might have done in that particular structure in that day and time. We’ll even have holiday travelers waiting for the train in our 1918 train depot.” Holiday scenes will be recreated in 15 diverse structures such as an 1888 half-dugout, an 1880 XIT ranch headquarters, an 1890 one-room schoolhouse, a 1780 fortified Spanish compound and the 1909 two-story Barton House. The annual event is free to the public with a minimum suggested $5 donation per family. VIP tickets costing $50 (max 7 persons per car) are available for those seeking early admission at 6 p.m. and VIP parking. To purchase VIP tickets, go to www.ranchingheritage.org/candlelight. Perhaps the most welcome feature of this year’s event will be no long entry line. Guests will enter through the front doors and proceed to Campbell Patio, where they can access park trails, buy kettle-corn and hear Christmas carols provided by the Lubbock High School choir. Visitors can choose in what order they see the historic structures, which lighted pathways they take, and when they exit the park prior to closing. Santa Claus will be located in the Pitchfork Pavilion but will leave promptly at 9:30 p.m. Visitors can purchase hot cocoa, apple cider and cookies in the decorated 6666 Barn while they listen to Brazos West play Christmas music with a Texas swing. Texas State Photographer Wyman Meinzer and Wilder Good author S.J. Dahlstrom will be at Cogdell’s General Store to sell and sign copies of their new books: Horses to Ride and Cattle to Cut by Meinzer (text by Henry Chappell) and The Green Colt by Dahlstrom. “Just as pioneer ranches had no electricity, our historic structures will be lit as much as possible with only lanterns, fireplaces and campfires,” Hodges said. The lighted pathways will be wheelchair and stroller accessible as visitors pass cowboys camped out with their horses nearby and a cowboy brewing coffee over a chuck wagon fire. For additional information, call (806) 742-0498 or view nrhc.ttu.edu. The National Ranching Heritage Center in Lubbock is located on the Texas Tech University campus at 3121 Fourth St; 6:30 to 9 p.m.
December 9 - 11 (Resumes Dec. 16-24)...Santa's Land Drive Thru Park - The park includes four acres of land, thousands of lights, 100 plus wooden cut outs, blow-ups, tons of Christmas trees, and decorated antique cars. Visitors are able to stay inside their cars or get out and mingle while enjoying a warm fire, hot chocolate, cookie and a visit with Santa. Train will be at Santa's Land Drive thru Park on November 24. 25 & 26 from 6:30-8:30. (Opening Weekend) Lights will be on the 25th in honor of Frances Chancy's & Jesus's birthday. Admission is free, donations will be accepted to help keep the lights on. We would love to invite you to stop by and see the lights and Santa (please bring your camera). If you want to make sure Santa will be present please call or text (806) 891-1291 Or check http://www.facebook.com/SANTASLAND79373. If Santa is present he departs at 9 p.m. Santa's Land Drive-Thru Christmas Park is located in Tahoka, Tx (30 miles south of Lubbock). Park is located at South 11th and Ave O (use Google map) just off of Hwy 87. We open at 6:30 p.m. Lights out no earlier than 10 p.m.
December 10….2 Hip Chicks Roadshow - THe ONE & ONLY show that has it all….. a traveling shopping event bringing you a mixture of just about anything. You will find boutiques, re-purposed furniture, upcycled, chippy, salvaged, vintage, metal art, childrens boutiques, food, beverages, and just good ole JUNK! Admission is free. It is an awesome girls' day out! Lubbock Memorial Civic Center, 1501 Mac Davis Lane; 9 a.m.- 5 p.m.
December 10….Wreath-making at the Arboretum - Deck the halls....with your own handiwork! We supply everything!! $5 suggested donation or bring canned goods. Helen Jarman will help you create holiday decorations. Materials will be provided as well as refreshments. If you have an ornament or item you would like to incorporate in your wreath, please bring it. Call (806) 797-4520 for more information. Lubbock Memorial Arboretum, 4111 University Ave; 10 – 11:30 a.m.
December 10….Science Spectrum Holiday Wonderland - Join the Science Spectrum for this free, family[friendly event that has become a favorite local Holiday tradition! • Enjoy Screenings of PBS Kids Holiday Programming. • Visit the Science Spectrum’s Holiday Train display, giant Christmas Tree, and other festive decorations. • Decorate and Eat your own Gingerbread Men. 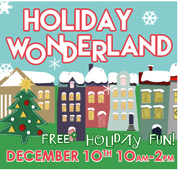 Holiday Wonderland is geared for families with children ages 2 to 12. All event activities are Free. Standard OMNI Theater and Museum admission rates apply. PBS Kids screenings of Peg & Cat Christmas and Daniel Tiger Winter Adventure are free to the public, but have limited seating. For additional event information visit www.sciencespectrum.org or call 806-745-2525. Science Spectrum & OMNI Theater, 2579 S. Loop 289; 10 a.m. to 2 p.m.
December 10….The Roundtable presents: Michael San Francisco 'What's Happening at the Honor College (Includes presentation of the check to the Honors College Scholarship Fund) - Our luncheons are held at Hillcrest Country Club 4011 N Boston Ave, Lubbock. North on University past State Living Facility to Newcomb, left for about 4 blocks and you will come to the entrance of the Hillcrest Country Club at Boston and Newcomb. Meeting Format: People arrive about 11 a.m. to start registering, pay for lunch and some socializing. Food service starts at 11:15 followed by introductions and announcements at 11:30.The speaker will start about 11:50 and be finished with the program and questions from the audience by 1 p.m. The public is invited. Lunch/attendance is fifteen dollars ($15) per person. Limited menu includes beverage and dessert. There are no membership fees or dues associated with attending the functions. Any extra monies that you would like to contribute will go towards the speakers lunch and towards our Honors College Scholarship fund at Tech. Our Saturday luncheons are a great way to (1) learn more about current global/US/Texas/Lubbock issues and events, (2) meet other people in area who may become lifetime friends (3) feel more at home in Lubbock. Most wear business or business-casual attire. No RSVP is necessary. Show up whenever your schedule allows, feel free to bring a guest(s) and email this invitation to anyone you think might be interested. For more information email Marie Evans at this address: mevans1398@aol.com. December 10….The Life and Art of Claude Monet with Christian Conrad - An artist associated with the Impressionist movement, Monet transformed how we think of color in visual perception. Part of the first generation of artists who explored painting outside of the studio, Claude Monet painted outdoors, capturing landscapes as they appeared depending upon the time of the day. As his career continued, Monet transformed his home into the famous Giverny gardens where he painted his large Water Lilly compositions. Join us for an examination of Monet’s art, home, and ground-breaking Impressionist technique. Saturday Lectures at LHUCA is an informal conversation over the life and work of contemporary artists. It’s a stress-free opportunity to examine the art and ideas that underlie much of the modern art world. Attendees are encouraged to ask questions and join the conversation. This event is free to the public. Join us for coffee and donuts. LHUCA, 511 Ave. K; 11:30 a.m. 1 p.m.
December 10….2016 Miracles Parade: “Lights Fantastic” – All are invited to celebrate the holidays during the annual Miracles Christmas Parade. Spectators start gathering early in the evening to get the perfect spot to watch marching bands, fire trucks, families, beauty queens, horses, dozens of decorated floats, honored guest and much more. The parade is free to spectators who enjoy picnics, “parade-gating” with a cookout with family and friends, or just sitting in lawn chairs or vehicles along the route. This event is family friendly and draws thousands of visitors from throughout the South Plains and Lubbock. The primary reason for the parade is to give back to the community and to promote an atmosphere of family fun, family entertainment, and togetherness. Each year, the parade will benefit the United States Marines “Toys for Tots”. Each year, we will work to make Christmas a magical season for families on the South Plains, and a time of sharing with those in need. The U.S. Marines will march along the route and collect toys from the attending families. 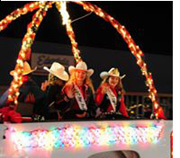 Together, the citizens of Lubbock and surrounding communities will “Fill the Float”. Hot chocolate, coffee, and hot apple cider will be sold at various locations along the parade route to benefit Lubbock charitable organizations. Including Lubbock Independent School Bands. An official parade website has been created at www.miraclesparade.com and is the source for official parade information. This year, the parade starts off at 34th Street and Avenue Q and heads west to Indiana Avenue beginning at 6 p.m. Don’t forget to bring an unwrapped toy for the U.S. Marines' Toys for Tots program. Avenue Q and 34th Street; 6 p.m.
December 10 (Continuing through Dec. 23)….Santa Land - Lubbock Parks and Recreation has hosted Santa Land for two weeks in December for over 50 years! Between 38,000 to 41,000 people visit Santa Land each year to see the festive holiday village with its huge lighted Christmas tree, animated displays, bonfires, holiday scenes, and of course, Santa and Mrs. Claus! Concessions available. Admission is free! Mackenzie Park - Use the East Broadway entrance just east of Avenue A and the South Plains Fair Ground; 6-10 p.m. nightly. December 11…Bayer Museum Of Agriculture’s 2nd Annual Farm Charm Kids Christmas - Santa and Mrs. Claus will be here for hugs and pictures! There will be activities, refreshments, and best of all, it's free admission! Enjoy a tractor and wagon ride around the museum grounds and to the Ropesville house. Decorate a Christmas ornament to take home and make one for a child at the Ronald McDonald House. Don't miss out on this amazing event that benefits the children and families of the Ronald McDonald House. For more information call 806-744-3786. Bayer Museum of Agriculture, 1121 Canyon Lake Drive; 3 – 6 p.m.
December 11….Flying J Wranglers in Concert: White Mountain Christmas - "Celebrate Christmas the Western way!" Join the Flying J Wranglers for an evening of great music, humor and yuletide cheer as they sing and play a mix of western, spiritual and popular Christmas classics. Featuring six outstanding musicians and vocalists, The Flying J Wranglers are: James, a singer/songwriter and rhythm guitarist; his wife Cindy, a distinguished three-octave vocalist and WMA National Western Style Yodel Champion (and comical sketch character); the renowned multi-instrumentalist Randy, (guitar, mandolin, banjo, dobro and vocals); cowboy Chaney on upright bass and vocals; fiddler and vocalist Corinna, and baritone vocalist Greg. This ever-popular act is a traditional favorite in every sense of the word....so don't miss your chance to celebrate a "White Mountain Christmas" with the Flying J Wranglers in the intimate Cactus Theater! Reserved floor and standard balcony tickets are $25. Purchase tickets by visiting cactustheater.com or call 762-3233. Cactus Theater, 1812 Buddy Holly Ave; Doors at 7 p.m.; show 7:30 pm. December 13….Holiday Chamber Concert - Lubbock’s favorite annual holiday chamber concert is back for the holiday season! Featuring five of the finest brass musicians in North America, enjoy an evening of holiday selections ranging from a variety of periods and styles along with laughter and entertainment. Following the concert, there will be a cookies and punch reception to further enjoy holiday festivities. The LSO is proud to partner with St. Johns Benevolence Program through their Tree of Warmth drive, providing half-priced tickets to patrons who donate warm apparel such as scarves, hats, and mittens to less fortunate community members. To get your half price tickets, come by the LSO office at 601 Avenue K to make your donation and help make a difference this holiday season while enjoying your favorite seasonal selections. To purchase tickets online visit http://www.lubbocksymphony.org/. 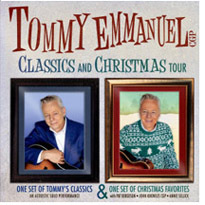 St John’s United Methodist Church, 1501 University Ave; 7:30 p.m.
December 13….Tommy Emmanuel: Classics & Christmas - Tommy Emmanuel’s five-decade career has garnered hundreds of thousands of fans worldwide, along with two GRAMMY nominations. Maintaining a tour schedule of nearly 250 shows a year, Emmanuel has been voted Favorite Acoustic Guitarist in both Guitar Player Magazine and Acoustic Guitar Magazine’s reader polls. Tommy Emmanuel makes his first-ever Lubbock appearance at the historic Cactus Theater on Tuesday, December 13 at 7:30 pm. Complete sell out is expected. Reserved floor seats, first 10 rows $35; remainder of floor $25; standard balcony seats $25. Purchase tickets by visiting cactustheater.com or call 762-3233. Cactus Theater, 1812 Buddy Holly Ave; Doors at 7 p.m.; show 7:30 pm. The Question: On which ‘feast’ did Good King Wenceslas step out, according to the well-known hymn? For this contest, 2 winners will receive 2 tickets to see Celebrity Attractions: Broadway Christmas Wonderland on Friday night, December 16th. To win these tickets, correctly answer the trivia question below and email it to us at info@lubbockfunclub.com using the fun phrase "The Most Wonderful Time Of The Year 2" as your subject title. Please be sure you can attend tonight's performance before entering....thanks! The Question: In which author's novel is it "always winter but never Christmas" ??? The deadline for this contest is Friday at noon and the winners will be contacted shortly thereafter. Please provide a daytime phone number where we may contact you if you are the winner.